Engineering Calculations for Excel (MITCalc) is a set of engineering, industrial, and technical calculations developed in Microsoft Excel. It will reliably, precisely, and most of all quickly guide you through the design of components, the solution of a technical problem, or a calculation of an engineering point without any significant need for expert knowledge. 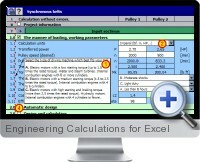 Engineering Calculations for Excel contain both design and check calculations of many common tasks such as: spur gear, bevel gear, timing belt, v-belt and chain drives, bearings, springs, beam, buckling, shaft, bolt connection, shaft connection, force couplings of shafts, tolerances, tolerance analysis, technical formulas and many others. Also available are many material, comparison, and decision tables including a system for the administration of resolved tasks. Engineering Calculations for Excel is an open system designed in Microsoft Excel to which further modifications or user extensions can be made without any programming skills. The straightforward and fully comprehensive Engineering Calculations for Excel user interface with complex on-line help and the 'expert notes' system will allows productivity for the system in just a few minutes. Engineering Calculations for Excel supports simple interconnection of individual parts between either each other, user defined calculations, or tables. Solutions can be easily customized to meet a particular requirement. Engineering Calculations for Excel also cooperate with many 2D and 3D CAD systems. To draw a designed solution in 2D or insert correspondent 3D models and their assemblies is a matter of seconds. Engineering calculations, tools and tables included are as follows. Straight beams with a constant cross-section. Shafts - design, deformation, strength test. Design of a transmission ratio. Transmission using multiple pulleys/sprocket wheels. Tolerance analysis of linear, 2D and 3D dimensional chains. Coupling of shafts using a key, grooving. Force couplings of shafts with hubs.